Hey everyone!! Every month I collect and showcase pieces I find online that I hope will inspire you to CREATE something great for what I like to call the "Inspiration Post." As busy as this month was, I ALWAYS find time to stay inspired. For May, I found myself constantly being pulled to all things space. This month's post is dedicated to "Retro Space Astronauts!!" 3-2-1 blast off (to the past that is)!! Space travel, anti-gravity, pets suited up in astronaut apparel, space camp?! When it came to the future, with a little imagination the possibilities always seemed endless. These aren't boring schematics from rocket ships, or museum quality photographs of the planets. These are imaginative and fun retro space travelers with unstoppable imaginations. Journey with these brave soldiers by scrolling down!! Is it weird that I have been a fan of this ad for many many years?! In fact it was one of my first desktop wallpapers on the PC I am currently writing this post from. "Puffin Biscuits," presents us with an atmosphere of flying buttermilk biscuits. 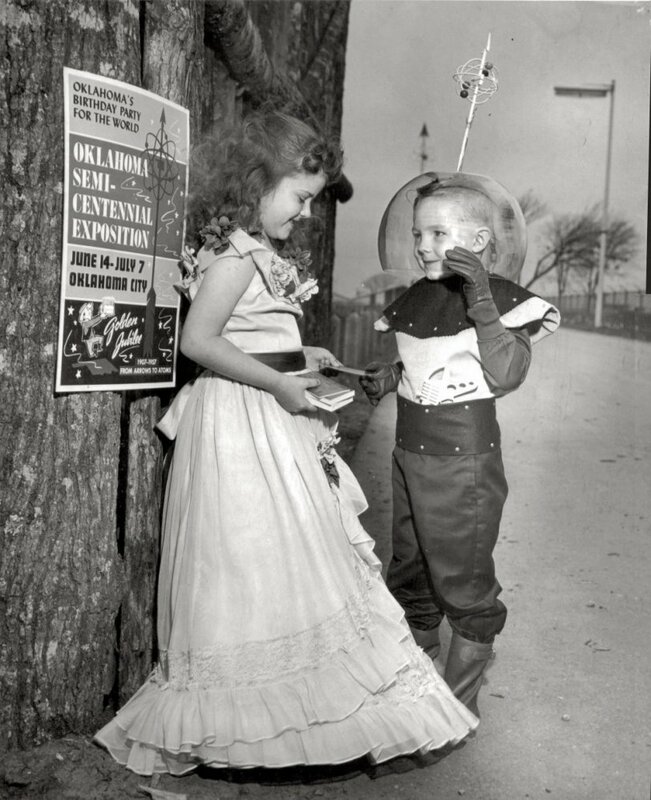 The little boy in the ad dons an astronaut's helmet while the little girl looks on with wonder. Is he really an astronaut? Probably not but the imagination that went into this ad is admirable and the artwork is excellent. Those Puffin biscuits look good enough to eat!! I originally came across this piece on Pinterest and it took me a bit to track down the original artist. Created by Moustafa Khamis, a designer and artist from Abu Dhabi on Behance, this poster is included in a set called, "Posters of a New Century." Although designed more recently, this as well as the other posters in the series have a very retro feel. With a simple color palette, distressed textured paper and clean layout this poster's friendly illustrated astronaut welcomes you to join NASA and see the universe!! I'm in! Not ashamed to say that I own this book. Yes, I am, in fact, ancient. I think it was something my library gave away when I was in elementary school. An original inspiration I absorbed into my brain as a young lady, it fondly continues to spark my imagination to this day! 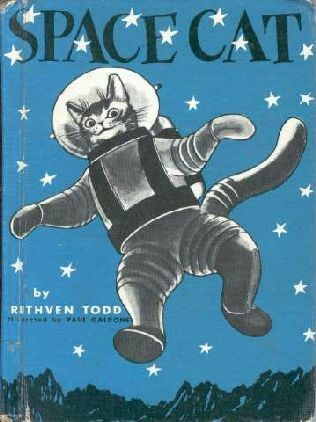 The first book in a series of feline space journeys, the book tells the story of Flyball, a cat who is rocketed into an outer-space adventure. Why can't they make more kids book like this anymore?! I love Barbie. If you think she isn't a proper role-model for young girls, I think you are wrong. The woman was in space (and still looked stylish doing it). This photograph of the 1985 astronaut Barbie was grabbed off of VOGUE UK's blogpost titled "Barbie Works," by Lauren Milligan. In a hot-pink space suit complete with fish-bowl helmet and futuristic poofy-sleeves, Barbie looks perfectly content and ready to claim that planet in the name of Mattel! This girly and sleek re-imagined space suit is something I would definitely don myself!! And last but not least, an authentic piece of nostalgic space history, the April 18, 1953 issue of "Collier's" magazine. This was the piece that was the main influence behind this post and one of the first pieces I came across this month that really inspired me. "Collier's Weekly," was an American magazine that roughly ran from 1888 to 1957. 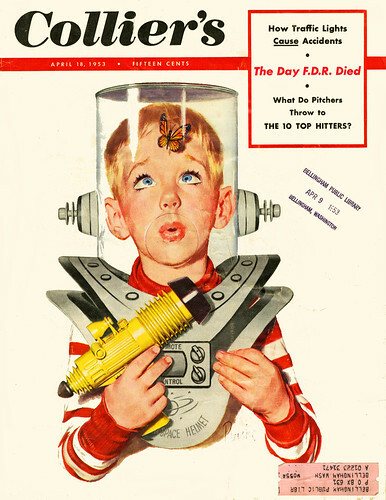 If you search for "Collier's Magazine Cover" you will be bombarded with brilliantly illustrated works of art similar to our space cadet above. This cover has it all!! A top-of-the-line ray gun, a crazy "space helmet," and a brave space traveler in awe at an alien species. That's it for this month's "Inspiration Post!!" If you're looking for MORE creative retro space travelers be sure to check out the Pinterest board I have dedicated to "Inspiration." The inspiration board always has extra pieces for each month's theme. What are you waiting for?! Rocket over to http://pinterest.com/nerdycupcakes/inspirations/ to check it out!! Have a great week everyone!! Happy Memorial Day / Sunscreen Day!! Lora Warnick "Dream Team" Illustrated Portrait!! Illustration Friday - "Tribute" to "Bun"